My third monitor is up and running. I have been splashing the picture I took of it once my husband got everything running because I am excited about it. However, Maq made a very good observation when he said that it is strange what a year or two of Eve does to you. Moar screens. The third monitor project became a pet project of my spouse after he saw my layered windows struggling to contain all of the Eve I needed to access during 7-2's most recent move. I have actually been using a two monitor setup for the last eight years. One was my gaming machine and the other was an older desktop top that ran various things. As my desktop became more powerful the monitors merged into one. 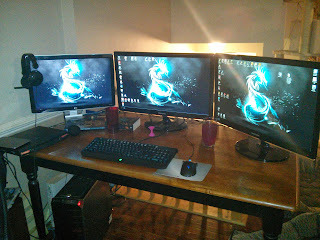 It wasn't until I started playing Eve that I decided that I needed two big monitors just to play. I now can barely function in a game that does not do windowed mode for instance. Sometimes, when someone wonders how one spends a lot of time at the computer, it may be because of something as simple as a setup. My desk is one of the most used areas in my home. I am very comfortable there. It no longer occurs to me that someone may not be comfortable therefore leading them to question my sanity. All told that is two 21 inch monitors and one 24 inch monitor. It is pretty ridiculous. My desk is a table. One of the most irritating things about desks is that they tend to be very expensive for what they are. This is a kitchen table from Walmart purchased for $99. It is the perfect height, it is deeper than most computer desks and it is ridiculously sturdy. I drilled a hole in the corner with a door handle drill thing and run all of my wires down to the tower. You can see the UPS tucked beside it. My laptop there is all updated and ready for Eve Vegas. My tablet is as well. I won't be taking my headset with me this time. I hope to spend a bit more time doing things. I will be blogging however. I have my notebook, tablet, and tablet keyboard with me. I won't do it live. They are going to stream Eve Vegas but I will wind up my thoughts and what I heard at night with my usual attempt to present the information clearly and as it was said. I don't particularly enjoy someone consuming and spitting it back out with their view on it. One can take their view from what was said and if and when I have my own view I prefer to make it clear that it is my view point. One more 12 hour shift and I'm off for the next two weeks with one of them in Vegas soaking up the Eve. The glass of liquid is making me slightly nervous. Well the red glass is water. The clear one is blueberry lemonade. ps: The clear one makes me really nervous. It's amazing how hard it is to find a sturdy desk - I ended up going to the same supplier that our work uses. I have pets. The hair and dander that clutter accumulates is awful and the cats will. Knock things over of it gets to messy. I try to clean up once a week and have a rolling file cabinet to hold documents. Have fun in Vegas! I enjoy your blog. Surfing the blogosphere and came across your post. 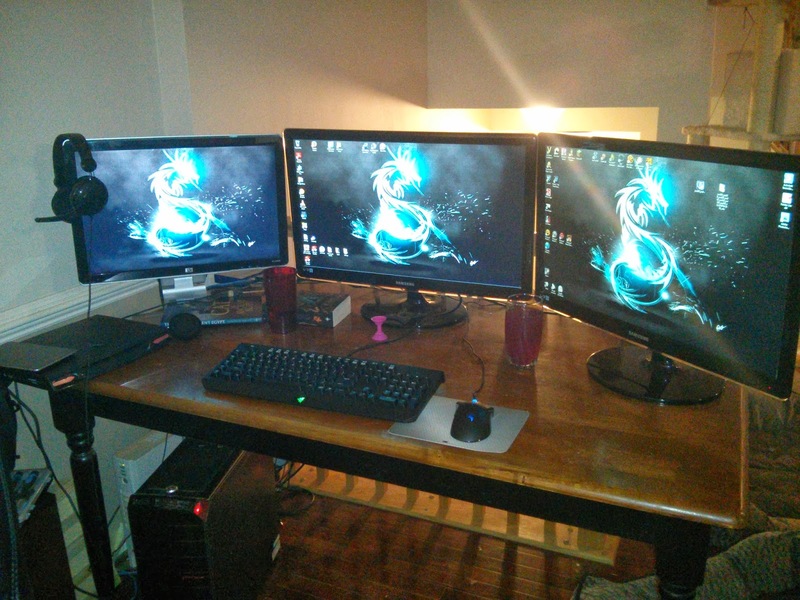 That tri-monitor setup is a thing of beauty - just saying.